I’m currently experiencing one of the busiest times as well as the most exhausting: end of term. There is no tiredness like teacher-at-the-end-of-term-tiredness. I have an insane backlog of blog posts which I am hoping to crack through now that the dust is beginning to settle! To tide you over, here is a quickie. The Howlin’ Wolf is easily one of my favourite bars in Glasgow. If I’m not looking for something in particular, I’ll end up here. They offer a range of cocktails with interesting specials, nice wine, decently priced drinks but most importantly: the music is all Blues and they have live music at weekends. My friend’s birthday involved a visit here and we decided to grab food to line our stomachs. I didn’t have low expectations, but I certainly didn’t think I’d be blogging about it! I have been going through a major phase of macaroni cheese addiction so I couldn’t resist this. I wanted to just add the chorizo into it, but I think the waitress misheard me as I got the chicken too. I’m glad this “error” happened as the chicken was chargrilled and the flavour from it was absolutely beautiful. The macaroni cheese was just astounding – so creamy and cheesey. I think it’s the best I’ve ever tried. Complaint: my garlic bread was burnt, and looked like even if it wasn’t, it would be flavourless. My salad was just lettuce. Not even nicely chopped up lettuce, just lettuce. My mojito was more of a salad as it contained more than one ingredient. I LOVE salads, so this really bugged me! Would it kill to chop up some tomato, cucumber and onion? This burger just had the WOW factor the minute it was brought out! The 7oz beef burger was topped with bacon, Stornoway black pudding, mozzarella, cheddar (you can see the cheese oooooozing in the picture), an onion ring & a side of creamy peppercorn sauce with the double cooked chunky chips. I sampled a piece and it was so good – definitely a portion for those with an appetite! The peppercorn sauce is really fiery – I loved it! I ordered these on a separate visit to the aforementioned burger and macaroni cheese but they are legit the best Nachos I’ve ever eaten. 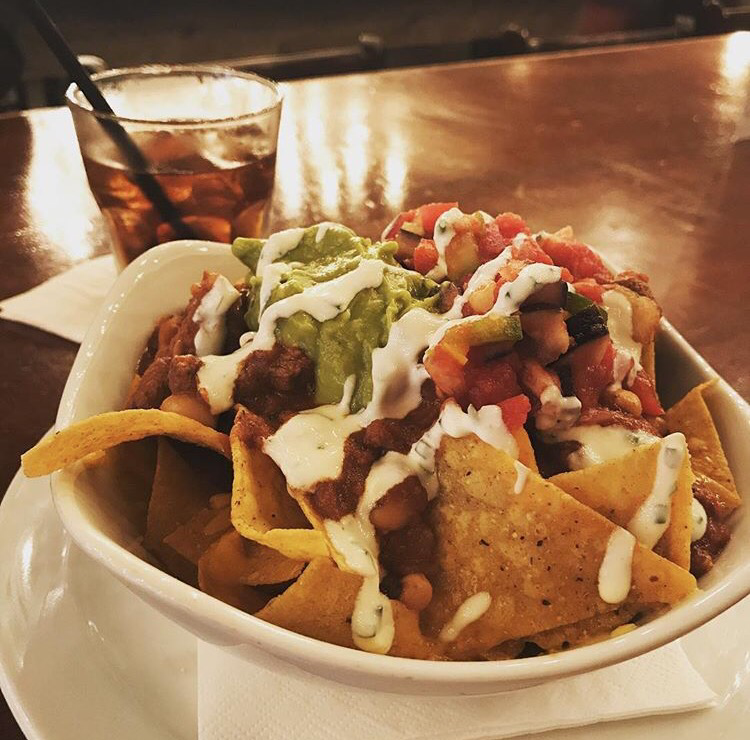 The chilli con carne is layered with the nacho crisps to give great coverage and none of those rubbish dry patches – I hate being left with plain crisps when I order Nachos. The guacamole and salsa looked like it was in short supply but it was actually fine. And based on the service in the ‘Wolf I’m sure they’d give more if asked! A must-try! I do love a mojito. I needed this mild and refreshing after my epic cheese and meat based meal to ease myself into the beverage portion of the evening.